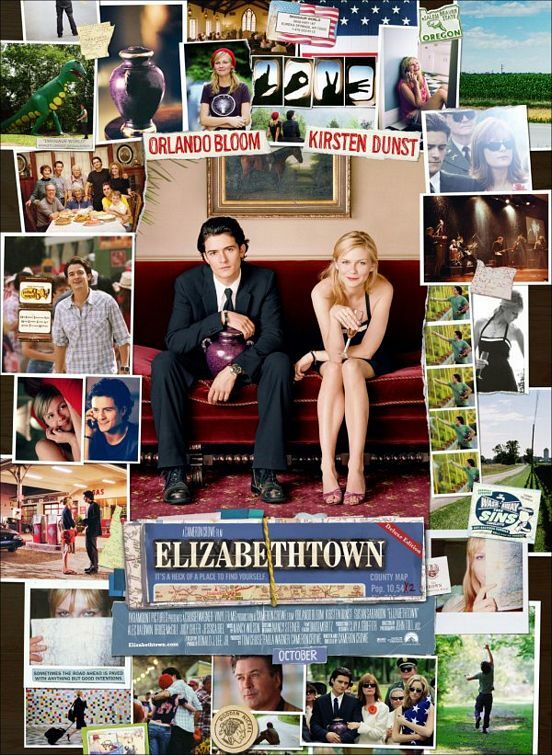 So I finally got around to watching Elizabethtown. I had been hearing about this ever since, oh, last August, all about how Ryan Adams had a bunch of music in it, blah, blah, blah. And then I remembered in a flash of glee that my Uncle Dave used to be the big impressive principal at E-Town High School (as those of us in-the-know call it), so I was doubly excited. Turns out my anticipation was for no good reason. The movie is tolerable, its salvation largely being the soundtrack, and also because Cameron Crowe just *knows* how to make a movie. I mean, all the elements are there – adversity of mythic proportions, family illness, quirky relatives, and even a perky love interest who shows no end to the depth of her random comments and bed-a-bility. What’s not to like? Well, the low point for me in the movie = Susan Sarandon tap dancing. Well, most of it was really speedy tap-dancing because it was on fast forward. Holy Moses. Did I mention it was at a memorial service? There was some poignant sighing in the crowd, some tears for the exuberant display of LIFE in the face of DEATH — aaaaand we’re done. No. While most of the movie was drivel, and even a little annoying (his sister in the film was unworthy of the name Heather because she bugged the crap out of me), the best part of the movie was absolutely the last 20 minutes where lead guy sets out on a roadtrip with many CD mixes made by aforementioned perky love interest girl to accompany his every vista and curve in the road. Also included with the CDs is a heavy-handed and, let’s face it, unrealistic handmade “roadmap”/scrapbook that I kept thinking she would have NO time to make, what with the rigors of flight attending, talking to lead guy on the phone at all hours of the night, painting her toenails, apparently knitting her own hats, and just generally being adorable (which is hard work, let me tell you). But what this roadtrip was really about for me was the glimpse it offered into the always fascinating musical mind of Cameron Crowe, who undoubtedly is THE best soundtracker in the known world. One reviewer referred to it as “Crowe’s gold-standard back catalog tastes,” and that is exactly what he has. I want to be his friend so we can ride around in his car and listen to his iPod on random. That would be fun. Tagged with cameron crowe, films, movie soundtracks, ryan adams. im pretty sure that kozelek track did get played…if not that one, then another. thanks for the tracks though. it’d be awesome if you got even more of ‘em up! after reading this post i read a lot of your other stuff and i loooooove your blog a lot! im adding you to my site! I never ever want to see this film. But i could listen to that ryan adams track over and over. And chances are I’m going to. nice blog entry as usual. i do agree that it felt disjointed; i think i would have liked it better if that last 20 minutes was just an independent vignette, kind of avant-garde, not having to fit with anything else. maybe the reason that i liked it was precisely because it was so disjointed from the rest of the movie! for example…i walked into work today…almost no one there….the intro to PUBLIC IMAGE by PIL starts in my haed..
“HELLO…HELLLLO…HELLO? HA HA HA “…. ok so you didn’t love the movie but at least you managed to grasp one of the most important concepts Crowe was putting forth: maybe it’s time for you to stop floating through existence as you think it’s supposed to be; maybe it’s time for you to take the wheel and plot a course. I enjoyed your blog, mostly because I’ve always felt like my life needed a soundtrack. I liked the movie, more because I could relate to the small town life, the relatives and what not. Then there was the road trip. I grew up with a road trip every year. As an adult, I missed that. My daughter and I took a road trip after her graduation, inspired by the Elizabethown road trip. It was great fun and I advise everyone to take at least one in their lifetime. I believe Crowe’ s wife Nancy (of Heart) does the music scores for his films.